I don't necessarily agree with the term that was coined for the first southern snow storm of 2011, but perhaps that's because we didn't get dumped on as much as other parts of the south. My mom on the other hand, probably agrees 100% as her Mustang GT was a casualty of the war. The snow hit early in AR and she hit black ice about 10 miles from her exit spinning into the semi-truck that was skidding out of control in front of her. She's fine and the car will be fine. Over here though, we only got about 2 inches maybe way less than what everyone else got but enough to enjoy some good winter fun. We are really lucky to have some great friends who live a neighborhood over so we headed over there Monday night to go sledding down their side hill. It was both mine and Sarah's first time sledding. She LOVED it! She giggled the entire way down and by the end would start laughing and rocking with excitement when Chris put her in the sled because she knew what was coming. And since it was my first time too, I enjoyed it with minimal injuries. Just one awesome bruise on my thigh from a head first trip down the hill. Here are the girls after their solo trip down the hill without any adults. I ran beside the whole time freaking out. Sarah loved it! She's giving a thumbs up, you can't tell though because I didn't have any gloves for her so she's wearing socks on her hands. 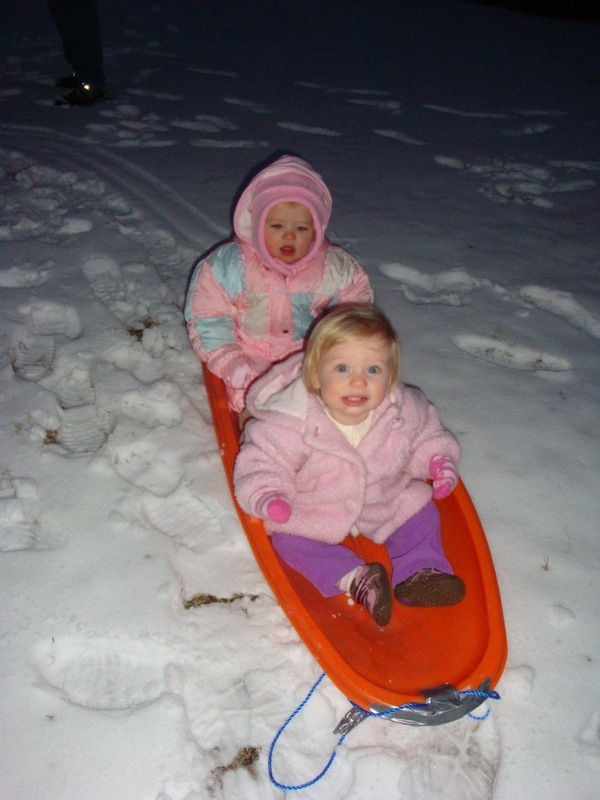 You've never been sledding before? How is that possible? Glad to hear your mom is ok.